If your imagination has also taken a vacation, and you're struggling to come up with any creative obstacle courses, treasure hunts or trampolympic competitions, you might want to leave the fun-spiration to our great range of trampoline accessories. Each accessory is quick and easy to assemble and use, and you won't have to worry about what to plan next. If you've got bored children who'd love to be learning skate tricks without the fear of landing face first onto the road, the Vuly Deck will be your secret boredom-busting weapon. The only trampoline deck on the market that's the shape of a real skateboard, it can be used to practice all kinds of tricks on a soft surface. The board itself is made from lightweight plywood and covered in a soft layer of high-quality EVA foam so you won't even have to worry about the board getting in the way of your child's fall. So, your idea of a quiet day involves cups of tea and a good book, and their idea of a quiet day involves turning the house upside down to make a cubby house in between the lounges, using every household item they can get their hands on. 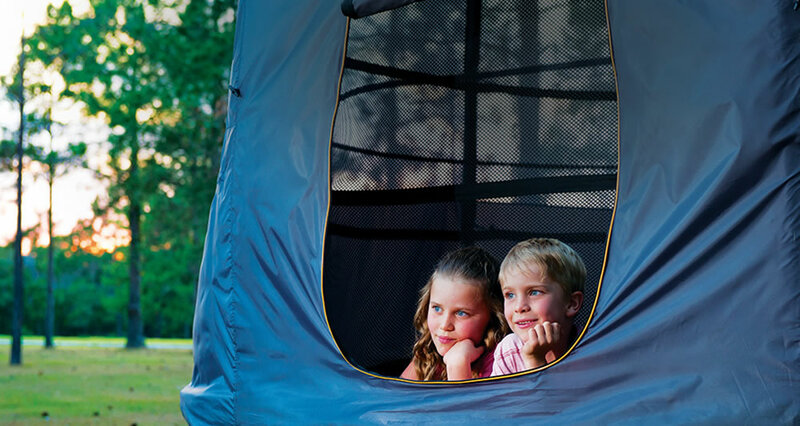 Bypass the usual mess, and set up your Vuly Trampoline Tent instead. The kids can adorn the inside with all the cushions, doonas, toys and activities they like, without commandeering every available space in the house. You won't even know they're in there once it's all set up and they've got their own good book to keep them entertained, but you can check on them through the panoramic windows from time to time. A Basketball Set is fantastic for encouraging kids to venture outdoors and onto the trampoline. They'll hardly notice that they're exercising as they try to shoot hoops from a height. Talent will develop with time, but the hoop is specially designed from the same material used in riot shields, so the ball will rebound effortlessly into the hoop. The hoop is pre-assembled, so just attach it to your trampoline and you're ready to score. Next week we'll tell you what the best holiday outing is, and where you need to go.